See Part I of this story in the post immediately below this. As part of the retreat, meeting facilitator Martha Lofgren also helped the group focus on what she called two-year imperatives. These are specific projects the city council and executive staff hope to accomplish in the next two years. Although Lofgren identified several keys areas for the participants to focus on, the group also held a brainstorming session. During this session, topics included road maintenance concerns, infrastructure, public safety and consolidation of government entities. Elk Grove Police Chief Robert Lehner expressed concerns about the effects of recent passing of Proposition 47 will have on crime rates win the city. Under 47, several crimes have been reclassified from felonies to misdemeanors. "It changes our focus," he said. "Our landscape has changed dramatically." With regards to government consolidation, Vice Mayor Pat Hume suggested the city look at taking over the parks and recreations functions currently provided by the Cosumnes Community Services District (CCSD). Hume noted the city is now developing parks and recreational facilities that are overlapping with the CCSD and suggested there had been talks in the past between the two entities that a merger of sort might take place. "Is now the time that the city should take over parks," Hume queried. "We are starting to overlap some of the services of the CSD." Hume stressed that fire services from the CCSD would remain separate from any possible merger. 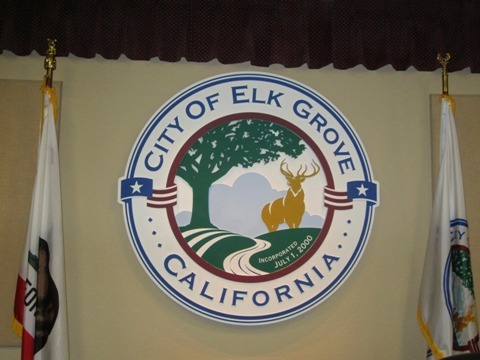 In a light-hearted moment, Elk Grove Council Member Steve Detrick suggested given the CCSD's loss of their headquarters in the recent fire, now might be the time. Hume agreed and noted given the outlay of capital the CCSD might need to build a new facility, now might be time to discuss merging the CCSD parks and recreation services with the city. Below are the highlights in each of the two-year imperative topic discussed. Discussing the city's sphere of application to annex the city's recently purchased 99-acre parcel on Grant Line Road, Hume suggested the process be streamlined. "I think we need to have a more comprehensive plan on how we pursue the SOI, " he said. Within this topic, transportation was also discussed. A consensus was reached that the city should continue its pursuit of building-out Kammerer Road and seek funding sources. "Transportation in general is an imperative for our city," Elk Grove Council Member Darren Suen said. Although the discussion included the possible extension of Sacramento Regional Transit's Light Rail to Elk Grove, the participants agreed that it was not likely to happen in two years. Elk Grove City Manager Laura Gill said she thought Light Rail would go to Roseville and Sacramento International Airport before Elk Grove. "Kammerer Road is a deliverable," Hume noted. One of the first topics discussed in this category was the city-owned empty parcel in Old Town Elk Grove. The parcel, which is directly adjacent to the Union Pacific Railroad track that bisects Old Town, has remained undeveloped since the city purchased it over two years ago. "We need to figure out what we want to do with that parcel," Gill said. Gill went on to say that a public workshop meeting on how the city should develop the parcel will be held in the next month or so. The two items of interest over the next two years were the proposed aquatics center and Grant Line Road soccer stadium and fields. Assistant City Manager Rebecca Craig said the aquatics center bid will go out soon and that it is expected to be awarded this summer. Even though Craig said an operator for the facility has not been identified, construction is expected to start this summer with a summer of 2016 opening. Gill also acknowledged on-going challenges regarding financing the proposed soccer stadium and field facility proposed for the Grant Line Road parcel. The original financing scenarios started at about $120 million but have been subsequently scaled-down. "I've got to get the site development cost down," Gill said. "I've got to make this thing pencil-out." During this discussion, Mayor Davis suggested that the responsibilities of his office and fellow city council might require a full-time staff person. Currently, the mayor and city council members are permitted a 12-hours-a week intern to assist them. Agreeing with Davis was Council Member Steve Ly, who noted his intern often works more than his 12-hours a week schedule. Hume disagreed saying "When I had an intern, it was a struggle for me to find enough work for her to do." Hume noted his intern frequently helped staff to complete her 12-hour schedule. Ly also queried if each council member could be given a budget to conduct individual community meetings. The last retreat-style meeting conducted by the council was in 2009. During their closing discussion, the council agreed that another meeting may be held two years from now to follow up on their imperatives progress and to look again at their long-term vision for the city. Building an aquatic center without an operator? No wonder they want to shanghai CSD into their organization! What happened to the public-private partnership on all these boondogles? The private sector is too smart to jump into losing propositions. A super bloated bureaucracy is on the way. Grab your wallets! Pretty chicken sh** for Pat Hume to want to start another takeover of CSD Parks and Recreation and hit them while they are down because of the fire. Does anyone remember what happened the last time the city of Elk Grove tried a hostile takeover? Seems the hot word "Olympic" was left out of the discussion. Still in the plans, but trying to keep it out of the conversation it seems. All sounded like a rehash of the years past...nothing groundbreaking discussed that I heard! You can call me chicken sh** if you want, it's actually refreshing from the inordinate amount of influence to which I am usually attributed here. However, my point had nothing to do with the timing of the unfortunate fire, rather just in the context of governance and the delivery of services. My question is how the taxpayer's dollar is best leveraged in the delivery of programming regardless of the agency providing it. If the numbers make sense for the city to do it and the public will supports that, great. If not and for whatever reason the status quo is preferable, that's great too. There is nothing "hostile" in my suggestion and hope that we are mature enough of a community to look at it. I hope accurate, non-politicized feasibility studies are used to analyze a potential CSD merger. We know that CSD wanted to steer clear of the aquatic center because it was a loser and more power to them (err us taxpayers) for recognizing it. Merge, and now they are tasked with operating and maintaining a loser. This all started with a few diving kids attending a city council meeting with their parents one night! The waterpark could not "float" on its own, and a taxpayer subsidized high-dive is just too much of a "leap". Wake up and smell your coffee! City should build a business incubator. I am surprised that they haven't proposed a stadium for the Raiders. We disagree more often than not on situations. And here again we won't be able to come to an agreement. I heard you suggest we need more homes to bring jobs. I agree, we need more homes to bring retail jobs and complete an outlet mall. I prefer high paying jobs, however we can't seem to do it. You may get your wish Hume about further empire building....only because you and I know it; there is overwhelming apathy in this city that grew so quickly....for many reasons; most commute elsewhere for their jobs....and knowing this planning the retreat time at 3pm was a smart move on your part to have very few residents in attendance. Follow the money....this city is planned around greed for a few, at a loss to many! Thanks to Pat Hume for at least responding to the citizens....too bad most of the others ignore their concerns and comments here and elsewhere. If we are still speaking about building an "Olympic" Aquatics Pool, does that not have to be reviewed by FINA to ensure it meets the required measurements and is recognized by the International Olympic Committee? Or do we just build it and hope they will come? Guess we'll know in a month or so when it comes before the city council again. This city just talks in circles so you never really know what direction they're heading. Anon.8:59...and I might add, it is good to hear from Mr. Hume. Someone who takes the time to communicate with us so we better understand his position. I appreciate that! I am sure the comment at 17:09 was done to draw out Pat Hume and it did. He needed to further explain his comments at the retreat. It is unfortunate, however, that the fire was even brought up. Pat was first running for office when the city and the CSD were suing each other over the parks in Laguna Ridge. It was a dark time for our city and we had the high weeds in the medians and corridors to prove it; not to mention the million dollars we spent using ourselves. Like many a citizen, I for one, never want to go through something like that again. Discussion is good, a revolution is not. Seeing how Harrison Ford had trouble making it to an airport yesterday, maybe EG can build an airport too! Elk Grove already has enough homes to bring jobs. Is this a city for and by the developers? Why should current residents be forced to let their lawns die, not be able to flush just so that home builders build new homes? Inadequate east west boulevards to handle the sprawl. Way too many houses and high density low income housing projects which result in masses of speeding maniacs. No turn in and turn out lanes to / from major shopping centers. No turn in and turn out lanes to / from major boulevards from intersecting streets. Traffic signals that aren't synchronized resulting in people racing make the next light. Red light cameras that cause people to slam on the brakes to avoid driving through on a yellow which results in rear end collisions. Yes, Thank you to Councilmember Hume for responding with a written comment. He and I could engage in a healthy debate if ever given the opportunity and chance. I give Councilmember Hume credit I have not had to guess where he is coming from or what his vision for Elk Grove is. He has been pretty clear on his position. He is articulate and smart. How is the city duplicating services the CSD is providing? By just talking about the aquatics center and the sports complex does not make it a duplication. It's just an idea and a bad one at that. Maybe the council should stop these projects so not to duplicate what the CSD is doing so well especially since the CSD wont operate the aquatics center at a loss. Also, last I heard we are in the worst drought in history why would the city want to build a sports complex that will take an enormous amount of water resources to maintain? Please start focusing in on unmet services and activities to make this a more well rounded community. Ideas like an arts center, multicultural center, performing arts center or museum. Making the plot of land in old town attractive and usable would be great! Please get the damn mall done! It is such an embarrassment and eye sore when driving on 99. I urge residents to watch the first tape beginning at 22:53 and listen to what Pat Hume says not only about fees but the fire at the CSD Admin building. Listen to exactly what Hume says about the timing being right because of the fire. This is contradictory to his comment above. Also listen to what Hume says about the potential lowering of fees such as park fees. The city has cut developer fees to the bare minimum not to mention the council is considering cutting new development park acreage from 5 acres to 3 acres per one thousand residents. So what now, not only smaller parks but Hume wants to cut park fees so that new parks are substandard? What is the city’s history is delivering new services? Do we trust the city to take on parks and recreation? Let’s look at bus services. E-tran services are being cut year after year. Or is this really about the city getting their hands on the parks and rec tax monies to funnel them to other projects, such as the aquatics center which Hume alludes to as one of the reasons. Remember, the city cannot even get an operator for the aquatics center. Why? Because the aquatics center will run a huge deficit and no operator with half a brain would take on that risk. Why is Pat Hume spearheading this now? He needs to answer that question. Are there underlying reasons here? How forthright he is being? Hume says there is a “bubbling” in the community for the city to take over parks and rec. What bubble? Who and why? Or is this Hume’s version of The Truman Show? LAFCo didn't trust the Council or the city to give them more land. What makes these power mongers think that LAFCo would entrust the city to take over excellent parks and recreation services provided by the CSD, one of the most well-respected special districts in the region? As previously stated, this is all about the city getting its hands on the parks and recreation money for their own agendas. A city by, FOR and of the developers. No wonder this place is becoming a miniature version of Phoenix. Hot, flat, boring, no culture, fast food and chain food joints, garish signs, cheap strip centers. "The city has cut developer fees to the bare minimum not to mention the council is considering cutting new development park acreage from 5 acres to 3 acres per one thousand residents. So what now, not only smaller parks but Hume wants to cut park fees so that new parks are substandard? "